ProForm Endurance 720 E Elliptical Review by Industry Experts. The ProForm 720 E Elliptical Trainer Is On Sale! A Top Choice for a Budget Price! Price Alert: This model is normally priced at $999. You may want to check out the SMART Endurance 920E instead for a better value. The ProForm Endurance 720 E elliptical trainer ranks as one of the top choices for a crosstrainer at the $799 price range, but you need to realize this is not a heavy duty elliptical. That said, ProForm typically offers more for less, since ProForm ellipticals are manufactured by the largest fitness equipment company in the world — Icon Fitness. They sell billions of dollars worth of fitness equipment per year, and economy of scale allows them to generally out spec the competition. Check out a comparision chart of all ProForm ellipticals here. In the past, we had complaints about this company’s customer service, but they have made great strides in the last several years to offer higher quality support. Regardless, the ProForm is still a good value buy because of the array of features. You may also want to check out NordicTrack, which is made by the same parent company. 20 Lbs. Flywheel — This is probably one of the heaviest flywheels you will find at this price range. The flywheel contributes to a smooth and natural elliptical motion. 19” Elliptical Stride — The 20” stride length on the ProForm 720 E elliptical trainer gives you an elongated stride rather than an oval and bouncy stride. Our team member Fred Waters reviewed this machine. He is 5’8” and a 20” stride is his preference. Adjustable 20 Degree Power Ramp — An incline feature is rather standard on elliptical trainers. By increasing the incline you get a more intense cardio workout and target different lower body muscles. However, they suggest the stride length on the ProForm 720 E is adjustable and can accommodate users of different height. That is really not the case. The stride length increases as you increase the incline, it is not “adjustable” as they imply. Adjustable Foot Pedals — You can adjust the angle of the foot pedals so you can minimize foot lift and potential numbness. Single Rail Tracking — We’re not crazy about the rail system that the pedals run on, but the design is fairly standard at this price range. If this elliptical is used by excessively heavy individuals or users who exercise aggressively, they may find the pedal start to loosen and shift over the years. If you want a more durable double rail elliptical, you should check out something like the Sole E25. iFit Live on the ProForm Endurance 720 E Console. Create custom workouts based on your fitness goals. The workouts are progressive and last over a several weeks and include audio coaching. With every workout your stats are downloaded onto your iFit.com account where you can track your progress through the reporting and colorful charts. Tracking your progress is proven to assist people in achieving their goals. Simulate exercising outdoors with Google Maps. You can track routes on Google Maps and through the incline feature the ProForm 720 E elliptical trainer will simulate the terrain. You can watch your progress on Google Maps through a smartphone or tablet. There is a platform on the top of the console for either device. Simulate exercising outdoors with interactive videos. iFit Live has a library of videos of famous landscapes from around the world. Like the Google Maps feature the ProForm 720 E will simulate the terrain and will sync with your speed. Note: iFit Live comes as an option. You can choose not to pay for the yearly subscription and just do without the programming. Heavy Weight — They don’t list the weight of the ProForm 720 E elliptical trainer, and we do not exactly know what it weighs, but we do know that it is one of the heaviest $799 elliptical trainers. That means it is also one of the most stable. Check out our comparison chart of all ProForm ellipticals here. ProForm Endurance 920 E – Spend $200 more for higher specs. – Read our full review here. The ProForm Endurance 720 E elliptical trainer falls firmly in the budget elliptical category. We feel the 300 lbs. user weight limit is excessive, and we would not recommend this machine for serious users. That said, for $799 features like the 20 lbs. 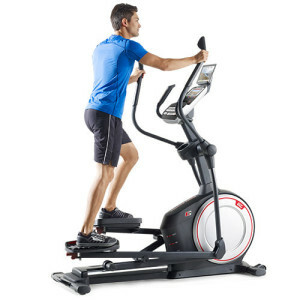 flywheel, adjustable foot pedals, heavy unit weight, iFit Live compatibility and 19” stride make the 720 E one of the best buys at this price range. You may also wish to check out the ProForm Endurance 520 E or SMART Endurance 920 E. With the SMART Endurance 920 E, you will spend around $200 more for a heavier 25 lb flywheel, more programming, a 7″ Smart HD Touchscreen, and a stronger warranty. I was able to purchase this with my medical flex spending and what a wonderful investment in family’s and my health. It is heavy and one should expect that it is difficult to move around, but not impossible. Fairly easy to assemble and works great. Are the 24 training programs in this unit or do they need to be down loaded? Does it have work out programs already or does it require iFit? Is there a protection plan that is offered to cover this unit after standard warranty, if so what will it cover and cost?